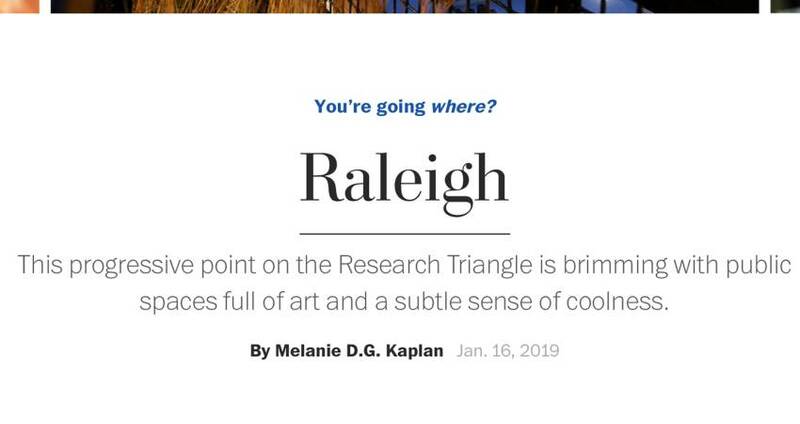 In all likelihood, you have seen a story about Raleigh/Wake County floating around the last few days from The Washington Post, written by Melanie D.G. Kaplan. If you missed it, you can read it here. It’s a stellar piece and highlights many of the visitor attractions, museums, restaurants, retailers and hotels that we all know and love. Many thanks to Melanie who did a great job of capturing the essence of the Raleigh area, its unique businesses and the passionate minds behind them. The D.C. area is one of Raleigh’s top markets in terms of overnight visitation, with both Virginia and Maryland being two of the top five states for overnight visitation to Wake County. We hope many a visitor from the D.C. area and beyond will make their way to the Raleigh area because of it. But beyond that, as we strive to show how tourism helps drive overall economic development for an area, it is also worth noting that Washington, D.C., is a top market for professional meeting planners who can bring meetings and conventions to Raleigh, as well as for site selectors who can help attract businesses to relocate and expand operations in Raleigh. So, an article like this, highlighting what makes Raleigh unique, goes a long way in building a sense of place and giving Raleigh an image, building our brand identity. This was something that recently came up as lacking in the eyes of site selectors involved with projects such as Amazon’s HQ2 and Apple’s Second Campus, both projects which Raleigh/Wake County was a finalist for but ultimately lost to cities with more established brand identities in the eyes of the general public and visitors. So, we hope more great stories like these will help to build Raleigh, N.C.’s image in the minds of key decision-makers alike. Because after all, it all starts with a visit. As the director of public relations & international tourism for GRCVB, Scott leads the Bureau's efforts to create awareness of Raleigh, N.C., as a premier leisure travel, group, meeting and sporting event destination in the southeast U.S., through targeted public relations as well as international tourism sales and marketing strategies.